EXCLUSIVE: As Obama Arrives in Jakarta, Secret Docs Show U.S.-backed Indonesian Special Forces Unit Targets Papuan Churches, Civilians | Democracy Now! National Coordinator of East Timor and Indonesia Action Network. AMY GOODMAN: President Obama is in Indonesia today on the second stop of a ten-day trip to Asia. It’s Obama’s first state visit to Indonesia after having lived there four years as a child. Obama and the Indonesian president Susilo Bambang Yudhoyono are expected to discuss the year-old U.S.-Indonesia Comprehensive Partnership, which covers trade, investment, military cooperation and other bilateral issues. At a joint news conference with Yudhoyono today, Obama talked about growing U.S.-Indonesia ties and his return to the country for the first time since his childhood. PRESIDENT BARACK OBAMA: Obviously, much has been made of the fact that this marks my return to where I lived as a young boy. I will tell you, though, that I barely recognized it as I was driving down the streets. The only building that was there when I first moved to Jakarta was Sarinah. Now it’s one of the shorter buildings on the road. But today, as president, I’m here to focus not on the past, but on the future: the Comprehensive Partnership that we’re building between the United States and Indonesia. As one of the world’s largest democracies, as the largest economy in Southeast Asia, and as a member of the G20, as a regional leader, as a vast archipelago on the front lines of climate change, and as a society of extraordinary diversity, Indonesia is where many of the challenges and the opportunities of the 21st century come together. So, promoting prosperity, expanding partnerships between our people, and deepening political and security cooperations, these are the pillars of our new partnership, which owes so much to the leadership of my good friend President Yudhoyono. I believe that our two nations have only begun to forge the cooperation that’s possible. And I say that not simply as someone who knows firsthand what Indonesia can offer the world, I say it as president, a president who knows what Indonesia and the United States can offer the world together, if we work together in a spirit of mutual interest and mutual respect. So, terima kasih and as-salaam alaikum. AMY GOODMAN: President Obama, speaking alongside Indonesian president Yudhoyono today. While Obama touts the so-called U.S.-Indonesia Comprehensive Partnership, human rights activists are calling on Obama to tackle U.S. support for atrocity-linked Indonesian military forces. Earlier this year, the Obama administration lifted a 12-year-old ban on the training of the notorious Indonesian military unit known as Kopassus. The special forces unit has been involved in scores of human rights abuses in East Timor, in Aceh, in Papua and Java since its formation in the 1950s. According to Human Rights Watch, at least 11 of 18 Kopassus soldiers convicted for human rights abuses since 1998 are still serving in the Indonesian military. Today we’ll spend the hour looking at the human rights situation in Indonesia and the U.S. role in abuses continuing to the current day. Joining us from Indonesia from the capital Jakarta, where President Obama is, is veteran journalist and activist Allan Nairn. In 1991, we were both in East Timor and witnessed and survived the Santa Cruz massacre, in which Indonesian forces killed more than 270 Timorese. The soldiers fractured Allan’s skull. Allan has now uncovered U.S. support for Indonesian military assassinations and torture of civilians. Earlier this year, he was threatened with arrest after revealing the Indonesian military’s involvement in the assassination of political activists in Aceh. And just today he has published on his website, allannairn.com, details of leaked Indonesian documents he says reveal Kopassus’s engagement in, quote, “murder [and] abduction” and the targeting of “churches in West Papua and [defining] civilian dissidents as the 'enemy. '” We are joined by Allan Nairn in Jakarta right now. The documents are posted on his website at allannairn.com. Allan, welcome to Democracy Now! Can you start off by responding to President Obama’s visit to Indonesia, the first visit since his childhood? ALLAN NAIRN: Well, it’s nice to be able to go back to where you grew up, but you shouldn’t bring weapons as a gift. You shouldn’t bring training for the people who are torturing your old neighbors. Obama said in his press conference that he wants to reach out to the Muslim world. He said there’s been misunderstanding and mistrust. Well, one way to start reaching out would be to the Muslims, and also the Christians and the Hindus, Buddhists in Indonesia, cut out all U.S. support for the Indonesian army that has killed hundreds of thousands of Indonesian civilians, as well as civilians in formerly occupied East Timor, and for the rest of the Muslim world, stop attacking Afghanistan, Iraq, stop the drone raids on Pakistan, Yemen, Kenya, elsewhere. That would be the beginning of a meaningful outreach: stopping your criminal acts. But Obama is not willing to do that, because he inherited a U.S. apparatus that worldwide, in dozens of countries, backs forces that kill civilians, and he elected to let it keep on running as it was, to keep it set on “kill.” The people who advised Bush or backed Bush now praise Obama. They say that he has continued the Bush approach. And he has. In fact, he has made it even worse by intensifying the attacks on Afghanistan and opening up a new front of open war in Pakistan. So, the sentiment about Obama’s return home would be more meaningful if he didn’t bring violence. AMY GOODMAN: Allan, we’re going to break. We’re going to come back to you, and we’re going to try to call you back to get a better line. Allan Nairn is an award-winning investigative journalist and activist. He’s speaking to us from Jakarta, where President Obama has just arrived. This is Democracy Now! Back in a minute. AMY GOODMAN: The music, Bella Galhos singing. She is a Timorese woman. I was with her in East Timor the day East Timor became an independent nation, independent after 25 years of occupation by Indonesia. 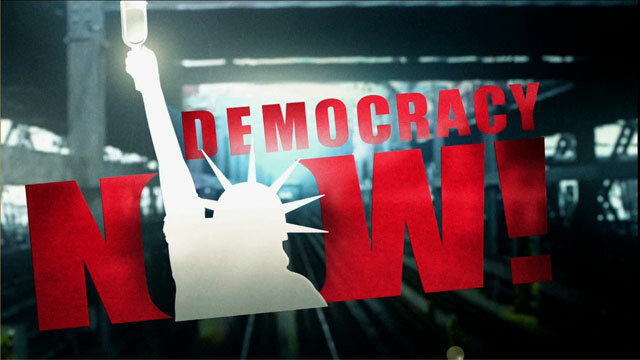 This is Democracy Now!, democracynow.org, The War and Peace Report. Our guest on the phone from Indonesia is Allan Nairn, award-winning investigative journalist and activist. We’re also joined by John Miller here in the studio. He’s the national coordinator of the East Timor and Indonesia Action Network. Before we go back to Allan, John, I just wanted you to explain how it was that the United States government, under the Obama administration, restored military aid, restored aid to Kopassus, the Red Berets of the Indonesian military. JOHN MILLER: Well, all military training to Indonesia was cut off in May 1998 due to another exposé of Allan’s and some documents Congress got. And gradually, since East Timor voted for independence, when all military assistance was suspended, it’s been restored. And the only thing that remained restricted was aid to Kopassus because of its human rights record. There’s a law, the Leahy Law, that says the U.S. should not train units that have unresolved or ongoing human rights violations, which certainly includes Kopassus. And the Bush administration, actually, a few years ago tried to restore aid to Kopassus, promised it to the president, Yudhoyono, and his own State Department legal team said no. And last summer, Secretary of State Gates — Secretary of Defense Gates went to Indonesia on a surprise visit, quick visit, and announced that the U.S. would engage with Kopassus. They didn’t say it would be full training, but they said that enough reform had happened — some of the officers, that had been convicted within Kopassus of killing a Papuan leader, who had been jailed briefly and then restored to the unit, were removed from the unit, though not from the military, significantly enough — and that that was enough progress to restore this last bit, and that they would focus on counterterrorism training. The thing is that Indonesian counterterrorism efforts have been focused on the police. And many in Indonesia, particularly in the human rights community, would rather not see the military, particularly Kopassus, involved in those efforts. There have been enough police human rights abuses involved in the anti-terrorism effort there. AMY GOODMAN: Allan Nairn, you have just today, right before we went to broadcast, released Kopassus documents on your website, allannairn.com. Explain what these documents show. AMY GOODMAN: Allan, I’m just going to interrupt for a second. It is a little hard to hear you; it’s not a great line. So I want to clarify some points. First of all, tell us about West Papua. Where is it within the Indonesian archipelago? What is its history? ALLAN NAIRN: It’s on the eastern end. It’s under de facto occupation. It became part of Indonesia through a dirty deal among the UN, the Dutch and the U.S. It was basically absorbed against the will of the Papuans. It is not recognized by the UN as occupied territory, but all of the Papuan population basically thinks of it that way. And these secret Kopassus documents that I’ve released part of today make it clear in their own analysis that they see that the Papuan people do not want the Kopassus and Indonesian army there. They want them out. But when they say that, the Indonesian army defines them as the enemy. AMY GOODMAN: Go on with the Kopassus enemies list that you have gotten a hold of and these documents that you have released at allannairn.com. This is very significant, given President Obama has just arrived in Indonesia, will be there for some perhaps 24 hours, though they’re saying, because of the volcano and the volcanic ash that could hurt the plane, they may be leaving hours earlier than they planned. ALLAN NAIRN: Yeah, it is very significant, because Obama’s claim was that Kopassus is reforming, cleaning up its act, just as the Indonesian military, the TNI, is also supposedly reforming. But that’s just factually inaccurate. The same people who committed the well-publicized atrocities in East Timor and Aceh are still there. They’ve been promoted. For example, the person who now runs the Indonesian Defense Ministry — the number two, but he really runs it — is an old Kopassus general, Sjafrie Sjamsoeddin, who was indicted for war crimes in East Timor — according to witnesses, was personally involved in executions. And now, President Susilo, the current president, who’s also touted as a reformer, gave him control of the Defense Ministry. So there’s this constant claim that they’re changing, they’re reforming. This happens basically every year in almost every country where the U.S. is backing a repressive regime. But in the case of Kopassus, these documents refute it. On the West Papua enemies list, for example, one of the people they have there is the mediator of the Papuan Presidium Council. And one of his predecessors, Theys Eluay, had his throat slit by Kopassus back in 2001. So, when they define you as an enemy, you’re in a dangerous situation. And in the documents, they describe what they call the “enemy [order of battle].” They describe the enemy tactics. They say there are two basic enemy tactics. One is calling a press conference to criticize the army and the government. And the second is criticizing the army and the government in a private meeting. So, in the Kopassus domain, in West Papua, if you criticize in private or public, you get defined as an enemy, and you’re subject to, as they put it, abduction and murder, which they say is routine among the security forces. These are Kopassus’s own words. I spoke to some of the people who were listed as Kopassus enemies, some of the ministers, the political activists, one of whom I reached in prison last night. And they described receiving a constant stream of SMS text message, telephone death threats, to be followed day and night, having infiltrators sent into their houses, surviving assassination attempts. And as one of the pastors put it, this is — you know, this is normal life for a religious person in Papua. And it’s even worse for the farmers, the people in the countryside. In the highlands, the Puncak Jaya area this past summer, the military did sweeps, where they burned villages, they killed civilians. And one of the ministers who was on the Kopassus enemies list gave a good explanation for why they do this. He said they usually do this twice a year, right before the provincial legislature decides on contributions to the military budget. And so, the military goes up into the hills, burn some houses, burn some churches, shoot some people, say that there are enemies out there, and they say they need more money. And they’ve extracted from the government budget. It’s basically what militaries around the world do, including the U.S. military. They conjure up or exaggerate threats in order to get more money and power. AMY GOODMAN: Allan, I wanted to talk about the case of Munir, Munir Thalib, the Indonesian human rights activist, the most important human rights activist in Indonesia, or I should say the most well-known one, because when we were in Bonn, Germany recently for a gathering of the Right Livelihood Award winners, he was one of the laureates. I met his wife, Suciwati. And we want to play her description of what happened to her husband. But I’d like you to set it up, who Munir was, what his significance is, and how that relates to what we’re talking about today — the Indonesian military, Kopassus and human rights abuses. ALLAN NAIRN: Well, Munir was a great man. He was a friend of mine. He was brilliant. Many Indonesians rightly saw him as a possible great future leader of the country. He was the toughest, most outspoken, most fearless human rights advocate. And the military killed him for it. There was a very telling incident right after the U.S. invaded Afghanistan. Munir, at that time, he had various human rights groups, and he was getting some money for them from USAID. So he had a relationship with the U.S. embassy. But he went out and led demonstrations against the U.S. invasion of Afghanistan. The U.S. embassy called him in and chewed him out and told him that he was consorting with and aiding terrorists. And while this was going on, the Indonesian military, under General Wiranto, sent thugs to attack him in his office and accused him of being a puppet of the United States, which is hypocritical since they were receiving weapons from the United States. But for demagogic reasons, they said he was the U.S. puppet. So they sent the mobs after him, while the U.S. was accusing him with playing with the terrorists. But Munir always spoke his mind and opposed the killing of civilians. And what happened to him was he, at one point, became burnt out, essentially. It seemed to me that he needed rest. And he decided to go to the Netherlands to study, to work on a law advanced studies program. He boarded a flight, and he died on the plane. He vomited to death from arsenic poisoning. He was slipped arsenic — and this has been established in court — by an agent of BIN, the Indonesian presidential intelligence agency. That agent was in direct communication right before and right after the poisoning with the general, General Muchdi, who was the number-two man of BIN, the presidential intelligence agency. Now, the BIN was and is today an associate of the American CIA. They have a relationship that is seemingly beneficial, which has been described to me as being extremely close. And in fact, the man who was boss of BIN at the time that the BIN killed Munir, the General Hendropriyono, was so close to the U.S. that he was granted personal meetings with Tenet, then the CIA chief, and Mueller, then the FBI chief, and he was often brought over to Langley for consultation. And his right-hand man, General Muchdi, went out and had Munir poisoned on the plane. AMY GOODMAN: We’re going to break early and then come back and hear a clip of Munir himself and then go to his wife Suciwati, who continues to call for justice in the murder of her husband and to call for the end of human rights abuses in Indonesia. We’re speaking with Allan Nairn, journalist and activist, who has just released at allannairn.com documents from Kopassus itself, including a target list, an enemies list that includes everyone from a Baptist minister in West Papua to the head of the Muslim Youth organization there. This is Democracy Now!, democracynow.org, The War and Peace Report. We’ll be back in a minute.